I have a confession to make. I’ve never been to India. It’s incredibly annoying to try to spend an entire month focusing on a place that you’ve had no first hand experience with. Which is why I’ve decided to call in a ringer. Erica Derrickson not only spent a significant amount of time wandering around India…she came back with a book full of photographs. Which, by the way, you can purchase (but more on that later). The photos in India: A Thousand Words are beautiful. The perspective joyful. They show a landscape and culture that is tangible – as if you could step through the image and into that world without missing a beat. In her introduction Erica describes India as a place of contrasts. She cites “poverty and privilege, abundance and scarcity, empowerment and disenfranchisement, purity and filth, the ancient and the modern, enlightenment and ignorance, and life and death.” But looking through the photographs I could see only the positives in that statement. So I asked her – did she do that on purpose? Here is her answer. India is indeed a country of extremes, and yet while my book does reference that in the opening pages, this book is not about directly portraying those extremes. While moments can be labeled as ‘joyful’ or ‘depressing’, the way I see it is that the images I take are moments that occur in the ambience of the contrasts of these labels. If you were to look, for example, at the picture near the end of the book of the young child wearing the orange top and a strange scowl on her face. I took this image on the banks of the holy Ganga river in the ancient city of Varanasi, aka Benares, one of the most sacred and ancient urban sites in India. Mark Twain once commented that “Benares is older than history, older than tradition, older even than legend, and looks twice as old as all of them put together.” The child is seated on the steps of one of these ancient bathing ghats (a set of stone carved steps and platforms created for accessing the river) from which the local population has been bathing for generations spanning across centuries. In this same holy city, along the same holy river, there are other sacred ghats that do not host the activities of the living, but rather the Hindu rituals of the dead. Every day, for the past two thousand or so years, hundreds of bodies are burned on grand pyres and ceremoniously interred in the waters of the sacred river. Hindus come from all over India to have their remains laid to rest in this sacred city; to have your body buried in the holy Ganga is to instantly attain Nirvana and end the cycle of life and death, and to wash your living body in its waters is to wash away your karma. Considering the ambiance of these extremes, bathing the bodies of the living in the same waters that are receiving the ashes of the deceased, the look on the child’s face reveals something different, or rather, begs some different questions. This moment of beauty, a fleeting expression that questions the origins of innocence, intends to offer a fleeting glimpse into a world so attuned to the cycles of life and death. 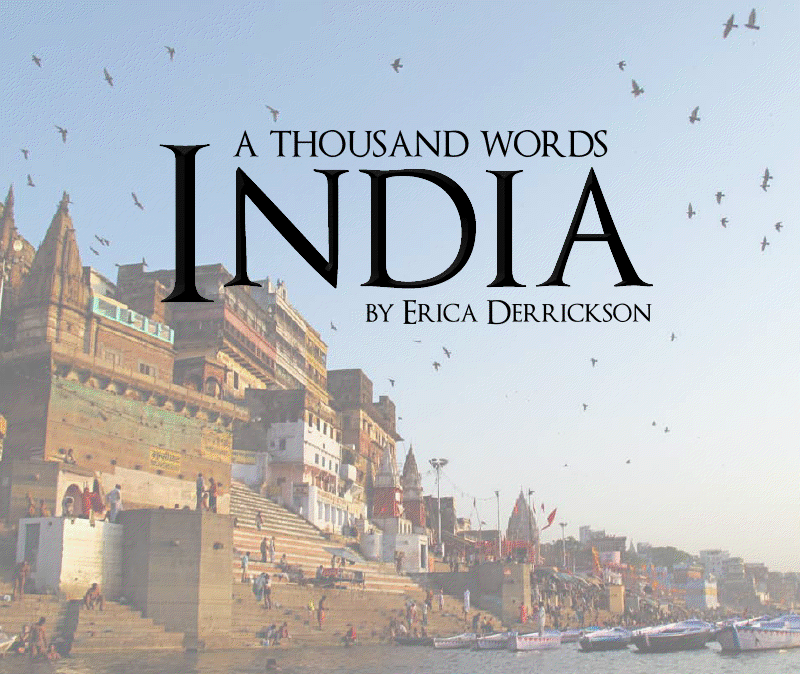 You can find Erica’s book (and see more pictures) by following the link to India: A Thousand Words. I visited India earlier this year and we went to Veranasi so it is nice to see the photos of the city here! I completely agree with the author about India being about extremes – I knew that before I traveled there but still found myself struck by that when traveling there. I’m glad you both like the photos. Colleen – I completely envy you! That must have been an amazing trip… I imagine India is one of the few places left in the world that lives up to expectations (and imagination). I don’t usually review self-published books, so when a mutual friend sent me Erika’s link I was a bit reluctant. And then I saw those photos! What blows me away is that her photographs show both the traditional and the modern side of India – and both sides are gorgeous and exciting. At the moment I’m reading Arundhati R0y’s book of essays, Field Notes on Democracy: Listening to Grasshoppers, which is a window into a whole other side of India I never knew existed. I’m always amazed at how big and how small the world can be at once. I’m so happy to see that people are liking my photos! It’s really like sharing a bit of my soul with the world, and to have that well received is so profoundly fulfilling. Thanks for your comments! If anyone would be so inclined please visit the book directly at http://www.blurb.com/bookstore/detail/1421864 and cast your vote to help me win the contest I’ve entered it in! Supercharged good karma and a long distance high five from me and my army of angels await anyone who takes the time to vote!